Kids can be fabulous travellers but just like grown-ups, if they are tired, hungry or bored, your time in transit can seem like it will never end. 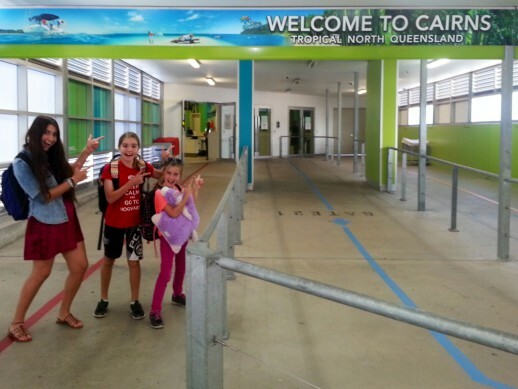 Here are 10 tips from personal travel manager Kylie Gretener, to help your entire family have a more relaxed and fun time while waiting at an airport. Patience – This is the number one thing you need to remember when dealing with kids during long waiting periods, and also on the plane. It should not come as a surprise that the little ones may not be happy chappies all the way, so be prepared to give them the support they need. Preparation – have some things ready to entertain them but don’t give them out straight away. Save something for when you have run out of other ideas. Some simple drawing books and pencils, a sticker book, a travel diary for older kids, or a favourite snuggle toy can keep them happy for some time. Movement – with many hours ahead of sitting on the plane, let the kids walk around and explore the airport with you. Use up as much energy as possible before they are strapped into those seatbelts again. Also use the time to go to the bathroom before the flight as it is often much easier than using the toilet as soon as they board. Travel games – there are small versions of many popular games, and a deck of cards or game of UNO are easy to pack in your hand luggage. Alternatively, let your children bring along their favourite toy cars or a small lego set, and if they’re in luck, they may be able to play with other kids who are also waiting for their flight. Research airports – many of the major transit airports now have great facilities for children so read up on the places you will be stopping and plan ahead. For example, Singapore airport even has a pool where you can pay a small fee to access the pool, take a refreshing shower, or relax by the bar. Shopping – older kids could help you pick up some souvenirs or gifts to take home if needed. Turn this into a fun game by suggesting that they try and find something they haven’t seen before which represents the country they are in. Have a look at things they are familiar with which may have labels in different languages and talk to them about the local language and culture. Snacks and drinks – children don’t always like to eat at set times, so pack some treats with you but avoid too much sugar otherwise they will be jumping around on the next flight. Plan your travel times – when you are booking your flights, check the transit times and work out what will be the best schedule for their body clocks. It’s much harder to keep kids happy if it is 1am for them back home and they’re overtired. Technology – A smartphone, iPad or tablet can be a great babysitter packed with easy-to-use interactive games and entertaining videos to help pass the time. Don’t forget to pack battery chargers so that the devices can be used when you really need them. Most importantly, remember to set boundaries, otherwise your children could miss out on many new experiences whilst exploring their new surroundings. When planning your next family holiday, get in touch with Kylie Gretener who can helps you from start to finish. About the Author: Kylie lives on the Sunshine Coast with her husband and four children who love nothing more than making memories together, and encourages her children to explore the world around them.